Spin Classes: How Do I Start and Which One Is for Me? One of the most popular fitness trends out there is high-end cycling/spin classes. There are a few different studios that hold cycling workout classes. This niche of working out seems highly specific, and yet, it has been catching on more and more. The concept is to simulate a cycling ride that you would do outdoors on an indoor stationary bike along with loud and motivational music and a few dance moves. For example, some cycling classes have you pedal to the beat of the music as it changes to incorporate an interval workout. The class instructors can also suggest a few dance and strength movements like push-ups or dips while pedaling. Spinning creates one of the best workouts if you push your hardest. It not only provides you with an opportunity for a cardio workout, but it also improves strength. If you use the resistance knob on the different spin bikes, you can make your legs work harder, and therefore, build up your leg strength. Spinning is a sport that does not discriminate against age, size, or level of endurance. Spin classes usually last for 45-60 minutes, which provides the perfect amount of time to get the heart rate up and pumping. However, while this type of workout seems like it would be really hard, it is tailored to how hard you push yourself. The class instructors give guidance as to how you should progress through a class both speed and resistance-wise, but they can only make suggestions. It is truly up to the rider to push themselves to workout with the instructor. Furthermore, as Harvard Men’s Health Watch states, spinning is a form of “low-impact exercise that places less stress on your joints, which makes it ideal for older adults with knee or hip issues or those recovering from orthopedic injuries.” This makes it a lot safer and easier to adjust to than it would be to running. Spinning is based on a class setting, which creates a group mentality and motivation. As a result, you will probably work harder with others around you than you would if you were on a bike alone. Overall, spin classes use all of your body weight and muscles to push up a hill or sprint down a road with other people around you. This way, you burn calories, have fun, and work on your endurance and strength. If you’re worried about it being too difficult, ask the instructor to help you with your bike setup and riding posture so that you can start off right. Then, maybe work your way up to staying for the entire class and adding the full resistance. It can take some time to get into shape, especially of this kind, so take it slow. Which Studio Is for Me? Besides your local gym, the prominent spin studios are CycleBar, SoulCycle, and Peloton. Obviously, your first thought should be the location. Not all cities have all of these studios nearby, so check out what’s near you before you decide. Firstly, CycleBar is a spinning studio that features a competitive and healthy atmosphere. Unlike some cycle studios, it has a competition board on a tv screen in front of the class. If you opt in, your name will be displayed according to a ranking that is made up of your power emitted, speed, and more. These are called CycleStats. The numbers can shift at any point in class, which helps you push harder if competition is something that motivates you. If you do not like this idea, you can also opt out and just cycle for fun. CycleBar uses a bar—no surprise here—instead of weights during the lifting portion of their spin classes. They believe in cycling to the music and doing weights to the music as well. Using a bar changes the types of exercises that they do as compared to other studios, but it is all for the purpose of toning the shoulder, biceps, triceps, etc. This portion of the workout usually only lasts for one song. Depending on the instructor, there is some choreography, like dips, which they tell you to do with the beat of the music. You are expected to keep up with the pace they set while doing these exercises, but it does not make up the majority of the class. Dancing is definitely not the main point of CycleBar. This studio really believes in endurance training through “pushing pace” to make you sprint as well as climb hills. They also offer monthly bundle deals that can save you a lot of money as opposed to the $20 drop in class. SoulCycle is another cycling studio that believes in pedaling to the beat. However, in my experience, they do a lot more choreography throughout the class. As a result, these classes are really fun, but feel more like a dance class than a true bike ride. Some people definitely prefer this, depending on cardio preference. Personally, I do not think SoulCycle’s music shifts in tempo as much throughout the class, so you do not change pace as drastically or as often as you would at CycleBar. The choreography becomes important because you’re using your body to make the entire session harder. For example, SoulCycle emphasizes “tap backs” during their rides to tone the legs. SoulCycle also uses free weights instead of a bar. The movements and amount of time spent with weights varies for each class, but involve typical free weight exercises like bicep curls. Instructors can even suggest dance moves while still pedaling and lifting weights. For this reason, SoulCycle will definitely help you perfect your coordination. The only downside to SoulCycle is that they do not offer any real discounts. They also require that you pay to use their spin shoes, which CycleBar does not. One class is $36 without shoes, which can obviously get very expensive. In my experience, CycleBar holds more giveaways and offers more discount options than SoulCycle. Peloton mainly features online spin classes. However, they do also have a few in-person Peloton studios in the New York City area. Peloton, as a company, is selling their bike, but they also create a spinning experience. 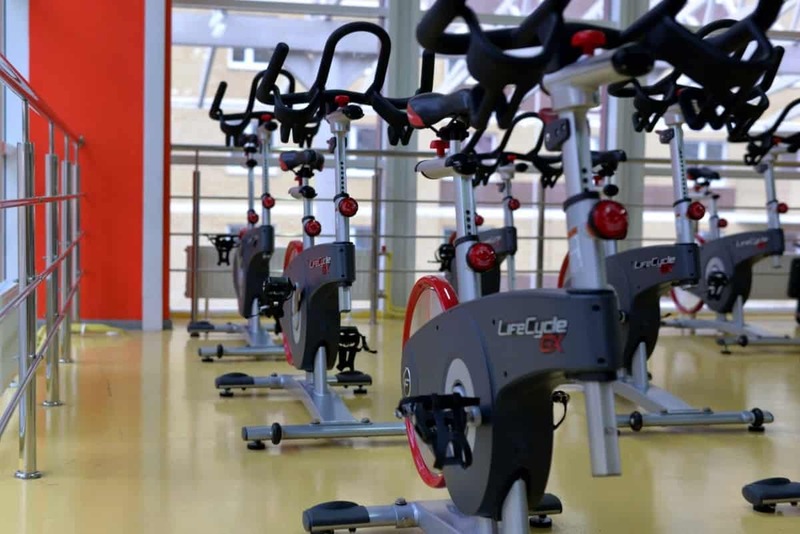 It is designed by indoor cyclers who feel that it represents the perfect stationary bike, especially for their classes. The best part about Peloton is that it is a one-time purchase and super convenient. While expensive, at $2,245, for just the bike alone, you will never have to pay for another spin class and can take as many as you want. There are 10,000 class options available at any given time because when you buy the bike, you get a subscription to all of the resources that come with the built-in TV screen. Because of Peloton’s online element, they definitely offer the widest range of classes available. They have workout classes on their Peloton Digital app that go beyond just cycling and use other machines such as a treadmill, weights, and more. This subscription is $20 a month without the bike needed. Based on these three studios, it is up to you to see which of these work the best for your workout taste. CycleBar resembles a real bike ride along with monthly packages that can save you a lot of money. On the other hand, SoulCycle provides a more expensive and choreographed workout including effective free weight exercises. Lastly, if you’re really busy with your family, work, or school, Peloton allows you to bring the studio to your home with the most variety of workouts. All three of these studios are guaranteed to get you in shape. They all have spin classes with a fun atmosphere and great tools to help you work out to your best ability. Hopefully, now that you know more, you can find your new cycling gym and discover a new community of fitness.